After a Texan dentist gave one of his patients a beautiful new smile, she gave him a reaction that he “will cherish forever”. 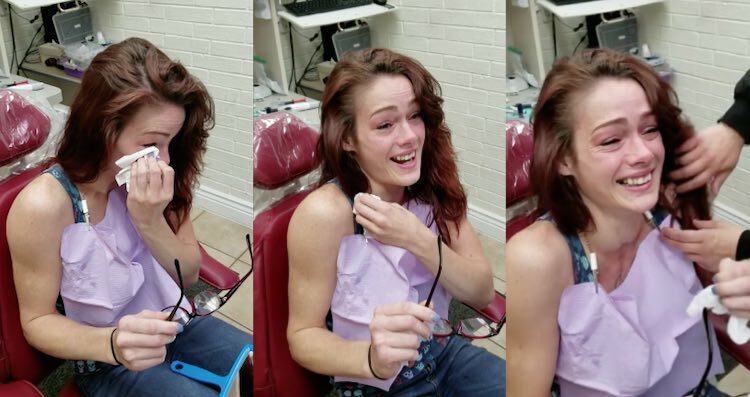 28-year-old Kyleigha Scott had originally gone into Kenny Wilstead’s dental office earlier this month for a wisdom tooth extraction – but upon inspecting her smile, Wilstead asked her why her front tooth was so damaged. The tooth was chipped and yellowed from when her abusive ex-boyfriend had headbutted her during their relationship two years ago. Ms. Scott said that she planned on getting it fixed once she got money from her next tax return. Wilstead, however, was having none of it. The procedure only took about ten minutes, but by the time the Marshall Family Dental worker was finished, Scott’s smile was barely recognizable. When the 28-year-old finally got to look in a mirror, she burst into tears of gratitude. “It looks amazing!” Scott says tearfully. Wilstead says that it was a moment he will never forget. “To all those who have struggled, she is an awesome example of someone determined to rise above her past and use it to reinvent her future,” wrote the Marshall, Texas dentist.